No idea how to link it to the blog. Definitely a few caption competitions in there. I’ve moved the flickr link to the top of the sidebar. To see the photos bigger click on any of them and open in a new tab, to see more photos, click on more photos at the bottom of the displayed photos. Edited to say : See Joe’s comment below on how to add photos to the Group 🙂 I’ve got my computer back so will add Brian’s later today. I have set the group up as public so no need for invites, if you click on the ‘More Photos’ link at the bottem of the photos in the side bar it will take you to the DDD2010 group. At the top of that page there is an option to join the group. Once you have joined you can then add photos to the group pool. The last 10 hotos added to the group pool show on the side bar. Mick your camera must have a make them look miserable filter!!! need to get some of mine up here! No, I just have that effect on people. But smiley pix can get a bit boring. Thanks for lift to Richmond – the journey home was pretty painless except for picking up a £25 taxi fare for the four miles from the station home. Thanks to everyone for really enjoyable weekend. And thank you to everyone from me too. Another grand weekend of shared experience and (generally helpful!) advice. I have a new (bread) year resolution, not to do more baking, but to widen the repertoire – I feel the need to make brioche, and lamb-topped flatbread, and many more delights. And extra thanks to Joe, Martin and Caroline for unending and generous hospitality. Special respect having just seen the “before” pix on Flikr. Blimey, what you achieved! Sorry Zeb. The last comment on Starters was a little frivolous. 5.5K ready for this evening’s mix. If someone can make sure there is 1K starter on Friday evening, that can be refreshed to make 5K for Saturday morning which should leave plenty for a refreshment for use later in the day + what should be needed for the morning’s doughs. I’ll try to remember to bring some rye starter. Just realised I misread something and it’s Gareth who’s going to the wholefood place at Northampton and not Zeb. So please G-Man can you purchase about 1K of maize meal and you shall be reimbursed. Plus a carrot. Parenthetically, I’m baking Big Gs Cherry Tomato Foccacia as my flatbread special on Thursday and hoping to make some dosh on your account. Wilco, going there tommorrow, I have though, a KG or 2 of this which is out of date. Dont know how sensitive it is to time, but you can have that free if you like! Hope A’s car can take it all! I’m not being stingy but the old stock will do fine. Really looking forward to the razor clams. Sorry mate, no razor clams. Something to do with rain on the beach! I know it’s really hard to impose discipline on the troups in a blog like this so this is as unruly a contribution as anyone elses. I’m coming up by train on Friday – supposed to get to Darlington at 13.13 – haven’t checked the buses to Richmond and beyond yet but I’m going to need a lift from somewhere mid afternoon. I’m coming back on Monday – have to be at Darlington also at 13.13 (worrying number of 13s in this). On a different subject – Gareth, please bring Billingsgate Market with you or the contents anyway. Zeb – where are you up to on einkorn? I have some einkorn grain (you probably gave it to me), some kamut grain and kamut meal, some grunkern grain and meal, and some emmer meal. Do you want me to bring any of this with me? Has Joe built the grain mill yet or should I grind it before I come? Plus, I’m hoping to bring as little as possible on the train, could you get the odd kilo of maize meal when you stop off in Northampton and I’ll pay you for it. Finally, I’m assuming there will be starter available so I don’t need to bring any. Going to be a great weekend – I quite like mud – it will remind me of North Wales. I’m getting to Darlinton at 9:34 on the Friday and then I’ve got to try anf find the two buses lol, I’m coming back on the Tuesday. Also got some smoked flour to put in the pizza dough maybe? 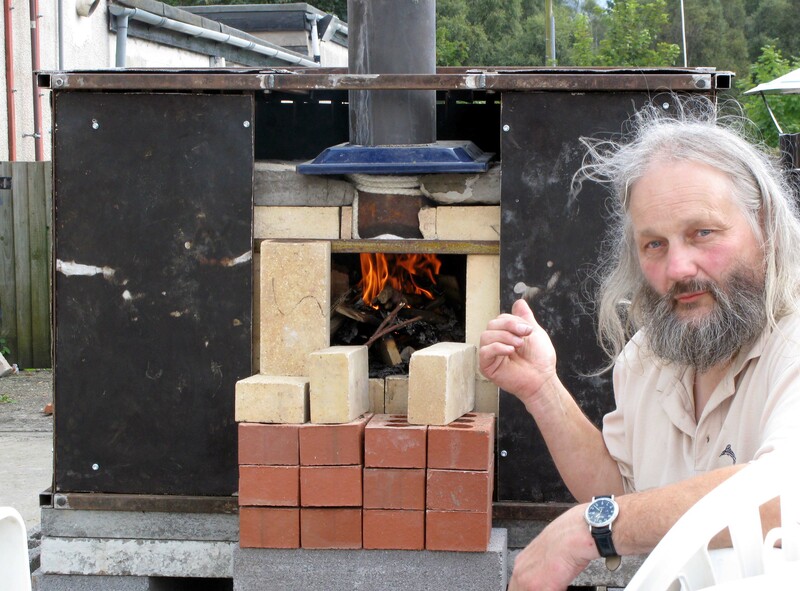 Will have an electric grain mill, Joes building an oven?????????. No Little Red Bus ’til 16.10. Do we have a list of people coming from Darlington? I was thinking more of brioche and chocolate and croissants and baguettes and trying to make a fendu that fendu’ed rather than the pure grain grinding experience, I thought the Dales were supposed to be decadent and butter-rich being near the Lake District and all, don’t they have six meals a day in the Dales, and two of them cake? I do hope so. I’d love to try the grunkern out, what is it? Do you have a formula for it Mick? Usual trade? Usual trade? I should coco. It’s cocktails this year. Grunkern is supposed to be the same as freekeh. 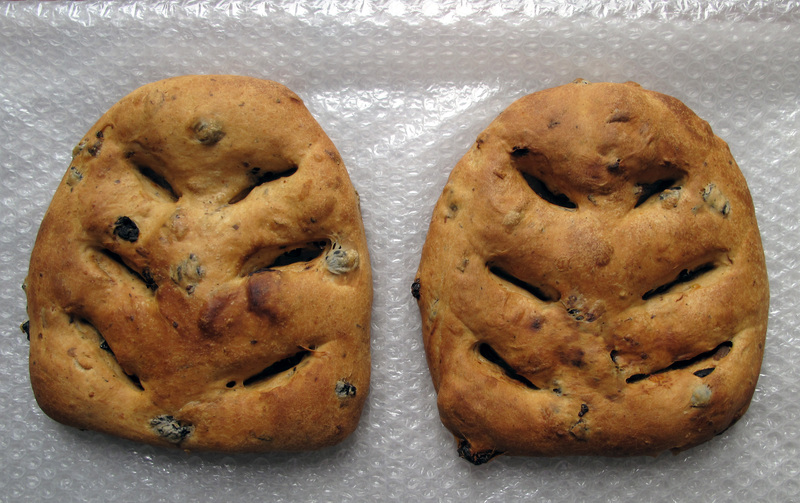 I have a recipe for grunkern/carrot bread which I think is one of Nils. Swing by New Covent Garden, Gareth, and pick up a carrot would you? Decadent? You must be thinking of Wensleydale. Lots o money there. All peasant farmers here. As for people coming from Darlo, will have a word with Joe on that one, when he surfaces, and let you know. Anyone experienced real Portugese bread? I’ve just been playing with a sourdough version of a recipe that claims to be authentic Broa de Milho but I don’t even know how to pronounce it never mind what it should come out like. Might bring some maize meal and have a go in the Dales. Might struggle with the fresh sardines. Maybe not that much of a struggle…since I’ll be down in Billingsgate Market on Thursday morning! Sounds like a good idea to me. Knew youd have to get yr hands dirty in the dales (thankfully). I remember talking to a multi-lingual Portuguese lass in Portugal and even she said it was a difficult language to pronounce (and speak). Unfortunately cant remember much about the bread, although if you didnt get to the shop before 11ish, it was all gone. how is the water supply going M? Not ideal, still low pressure here. Should be OK soon (fingers crossed). Fancy a baking weekend with LOW hydration doughs?? Never mind sardines – I was thinking more of a corn bread/absinthe diet. That’s a bit of a poncey recipe, Zeb. Ignoring the yeast, it’s got twice as much wheat as maize in it + sugar!!! Mick, I haven’t even read it, I was just amused that the moment you posted yours here, this appeared below as a ‘related post’. The spookiness of WordPress in action 🙂 oh and here’s another one http://www.purplehousedirt.com/content/broa On the corn bread recipe front, Celia (Figjam and Lime Cordial) made a sourdough version of JHamelman’s cornbread which she was very pleased with. Maybe compare yours to hers? It looked lovely! I trust you all caught last year’s host in a live interview from Mair’s Bakehouse on Radio Wales this morning. The weird thing is they interviewed him as if he was a “normal” baker about the failure of the Russian wheat crop and what that would mean for bread prices – like every baker is up at 5.00 a.m. firing up a 5×7 Alan Scott oven for tomorrow’s bake. Be nice if that was the norm. Can you get it on ‘listen again’? Can I vote for chocolate brioche? I’ll bring chocolate 🙂 Edited to say: Do you make a starter like the one for pannetonne for this? Just my regular starter. I KNEW you’d go for choc – why not? It’s good for breakfast. 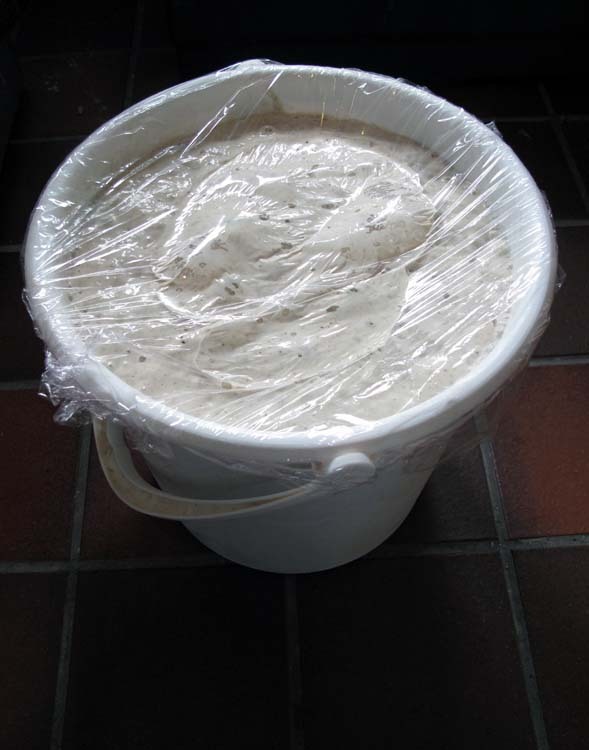 my sourdough starter os only 5 years old,but i feed it daily and its ok.
where do you live? just wondering because you seem to be doing really well in your customers. i am looking forward to the baking weekend as it lets me meet new poeple who i can talk about this subject to, i dont have anyone round here apart from the bakers i talk to using twitter. and hopefully ill learn alot more. I have a whole book on how I started making bread for sale. But basically it’s better than working. I’m too old to understand or use Twitter. And I live in Bethesda, Gwynedd. Time I sorted out my travel arrangements. I’m just coming up for a rest so if anyone wants me to do anything I shall be available.